“Disability Studies and Inclusion” is a collective volume that, from transdisciplinary and dialectical points of view (while still included in a common ideal horizon), gives voice to the debate surrounding disabilities that is developing not only in the academic and research field, but also in the social, cultural, and biopolitical one. 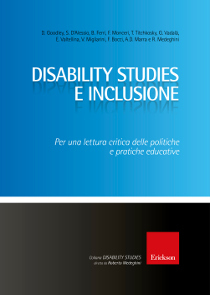 Considering Disability Studies and Critical Disability Studies, which are oriented towards making a point of topics and discussions that are too often taken for granted, the authors critically discuss the assumptions and paradigms that generate interpretations of disability, deficit, normality, pathology, abilities, as well as the social and educational policies and practices that follow. In the first part, the authors analyze the relationships between inclusion on the one hand, and ableism, racism and representation of power on the other. In the second part, they deconstruct the language through which social devices are ordered and practiced, tending to conform all that diverges. In the third part, they focus on school inclusion in particular, describing which effective practices can be implemented and which, on the contrary, produce discrimination and marginalization. THIRD PART Where is the scholastic inclusion?